So the fine folks at Whistler Classic Soda have been busy. They’ve built the wonderful Blue Sun Soda Shop, a veritable cathedral of craft soda. It’s just north of Minneapolis, which means I can now drop by. I’ve seen soda shops before, but none like this. Soda is first and everything else comes second. They’ve got over 1300 flavors of glass bottled sodas, over 100 root beers. Granted, I’ve had almost all those root beers, but they still get some new ones. Plus, they’ve got a classic arcade with a window looking into the bottling plant. With a super fast soda chiller (3 minutes) this is a place you can just spend the afternoon, drinking your favorite brews and slamming quarters in the pinball machines (which I did when I picked up this root beer). Whistler itself has even expanded their flavors to include this butterscotch root beer among other new ones. They got bigger bottles too. You’ll have to click the picture in this post to see the cap which denotes the flavor. Returnable bottles and identical labeling help keep the costs lower. The Body has a nice full butterscotch flavor, but a conspicuous lack of anything else. There’s also something off under the surface, an alkaline flavor of sorts. This flavor continues into the Bite, which is mild other than this alkaline burn. The Head is short, but it lingers. The Aftertaste is a light, sweet, butterscotch that is eventually replaced with this baking soda type flavor. Yeah, this is not the best. It isn’t terrible though. I just really don’t like it. Why can’t I like these guys’ soda. They’re 0/3 for drinkable ratings, but I love everything else about these guys. I’ll be a frequent visitor of their store, but I don’t see me buying more of their root beers. Maybe their next flavor will be a win? Here’s hoping. See how it rates against other root beers. Another brew received in trade from that great root beer lover Tony. 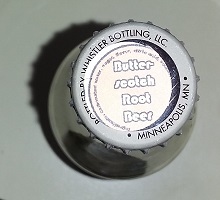 This comes out of Minnesota, if you couldn’t guess by the large silhouette of the state on the label. I’m not sure why the only star on the label happens to be on the south eastern corner of said state and not the north as the name would suggest. Another root beer mystery for the ages. Like why they had to use so many different fonts, or underline all of the ‘o’s. It is bottled by Whistler. It appears that this is just a different brand from the same company. The main point of this is non-returnable bottles as opposed to Whistler’s returnable bottles. Evidently, this is “crafted in teeny batches”. How small a batch does it have to be to qualify as teeny? A couple of bottles? A couple of cases? A couple of pallets? Either way, it doesn’t sound like they make much of this at a time. They also use “super filtered water” which is another term that’s as ambiguous as it is uncommon. It’s also made by a “handful” of people. I shudder to think what their recipe is like. Perhaps a bit of sugar, a tad of sassafras, a smidgen of cinnamon (it is a teeny batch after all). The Body is sort of sour and fruity with a generic creamy root beer flavor. It has a Bite that is sour and sharp, which is not what I like. The Two-Second-Head doesn’t help it either. The Aftertaste is some nice vanilla with a slightly fruity tinge. This root beer just fails to impress in every category. I wouldn’t drink it again and neither should you, but I will say that it is an improvement over the original Whistler, albeit much more generic. See how it rates against other root beers. One of my favorite Jethro Tull songs is The Whistler, and I always start humming it to myself when I think about this root beer. Just thought I’d throw that out there. Whistler Classic Soda is a different kind of company. They wanted to bring back the days of yesteryear when the local bottling plant would have returnable bottles you’d pay a deposit on. They think less carbonation and simpler ingredient and real sugar (is beet included?) is the way to go. I like the idea of returnable glass bottles, more environmental and stuff and other than weak carbonation the premise seems promising. They actually liked my Facebook page when they were just getting started and promised to send me some …and they never did. So I had to resort to trading with a fine fellow named Tony who is a loyal fan. The bottles are thicker glass than most which makes sense if they are reusable. It’s only 8 ounces unfortunately. Other than that, there’s nothing else to say about the plain bottle other than the cool spiral grips at the bottom. It has a light and herbal sort of Body with a decent spiced Bite containing cinnamon. It isn’t as sweet as most brews. The Head is worse than a “two-second-Head”, though this is by design. The Aftertaste is anise and cinnamon. Interesting and unique. But, it’s not all there for me. It needs more carbonation and a stronger flavor. It reminds me of Uncle Scott’s but less complex. I can see why they didn’t want to send me a sample. See how it rates against other root beers.